In small bowl, combine mango, red onion, jalapeño, dill weed, salt, 1/4 cup cilantro, lime peel and 1 tablespoon of the lime juice; mix well. Cover; refrigerate. Heat oven to 450°F. Unroll pie crust. Using 2-inch round cookie cutter, cut 24 rounds from pie crust, rerolling dough if necessary. Press 1 round in bottom and up side of each of 24 ungreased mini muffin cups. Bake 6 to 9 minutes or until golden brown. Cool crusts in cups 15 minutes. Transfer from cups to cooling racks. Meanwhile, in small bowl, combine avocado, goat cheese and remaining 1 tablespoon lime juice. With fork, mash avocado and goat cheese until mixture is smooth. Spoon mixture into small resealable food-storage plastic bag; seal bag. Cut off corner of bag. 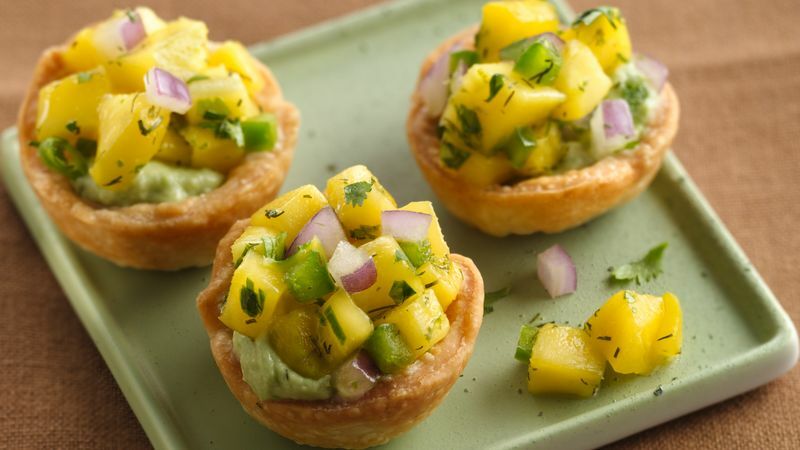 Pipe 1 teaspoon avocado mixture into each cup; top with scant 1 tablespoon of the mango salsa (cups will be full). Garnish with cilantro. Store covered in refrigerator.